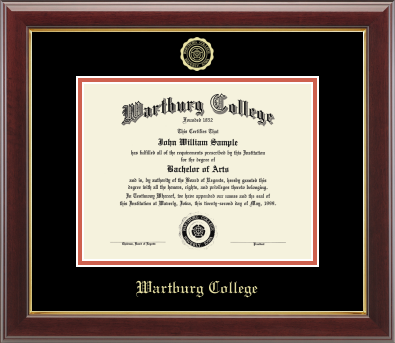 Features Wartburg College and official seal gold embossed on black and orange museum-quality matting. It is framed in Gallery moulding crafted of solid hardwood with a high-gloss cherry lacquer finish and gold inner lip. Includes easy-to-use Level-Lock Frame Hanging System. This frame is handcrafted in the USA. SKU 10283868. Due to the oversized nature of this item, a special shipping amount of $21 will be applied to your order.